All New Fortuner which has just been introduced already accounted for the sale of as many as 2,000 units at Auto2000. The number of changes made many consumers are interested in buying it. Agus Prayitno as Chief Executive Auto2000 any pass that Number 2000 unit sales of All New Fortuner manifest also due to customer trust. Therefore this dealer does not mess with his Ministry. "To give you the best experience in owning a vehicle Toyota, we will continue to maintain our quality and service," said Agus. All New Fortuner comes with 6 line up with 3 main types namely, VRZ and SRZ as latest grade, as well as g. Recorded during the seven-day sale All New Fortuner through Auto2000, type VRZ 4 × 2 dominated sales amounted to 1431 unit with a percentage of 70% of the total sales of All New Fortuner. 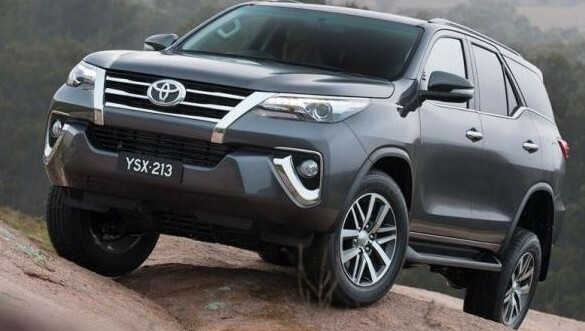 "New week All New Fortuner was launched apparently society has given a positive response, and Interestingly, a variant of the sought-after customers are the type a 4 × 2 VRZ is one of the newest types of launches," said Martogi Siahaan as Chief Marketing Auto2000. Sales composition consecutively All New Fortuner 4 × 2, i.e. G-type with 14%, and type SRZ by 8%. While for All New Fortuner 4 × 4, i.e. 6% VRZ-type and G-type of 2%. "Our sales during the week, there are three favorite colors, namely the Attitude of Black Mica, Super White II, and Phantom Brown which is a new color," said Martogi. Martogi else added the 92% of the total sales of the new Fortuner Diesel is dominated by, and this in accordance with the predictions of Toyota Astra Motor diesel variants by presenting more than gasoline. Automatic transmission ever more devotees if compared with the manual transmission, with a composition of 92% for the A/T.